I think I have found the gastronomic bargain of Paris. My discovery came when I was very angry indeed. I am, by nature, a placid sort of fellow. It takes a lot to stir the fires within. But the combination, on a Friday evening, of Parisian taxis and Parisian traffic sent me into a paroxysm of rage. First, the taxi – booked well in advance and dutifully confirmed – failed to appear. The hotel concierge told me that such a ‘no-show’ was typical. It took the porter, running this way and that, fifty minutes to find a replacement. This taxi, with your correspondent inside, then sat motionless in a traffic jam for half an hour. When he dropped me off in the rain, the driver assured me that my destination was “just around the corner”. In fact, it was a miserable ten minute walk away. When I arrived at the door of Aux Lyonnais, I was seething. I walked in, and within thirty seconds my equilibrium was restored. I was greeted by the manager, Eric Mercier, a fine fellow from Chambery, in the Alps. Monsieur Mercier took the apology for my tardy arrival with perfect grace, and led me to a table by the wall. All around folk were tucking into their food and talking with happy animation. Across the tiled floor waiters in red aprons sped in various directions through the painted iron columns. It was as if I had joined a party at which everyone was having a terrific time. I took in the wooden panelling, the bevelled mirrors, the oak tables and the 19th century light fittings and thought that this was exactly what a bistrot in Paris should be like. Indeed, this place has a fine pedigree. It was opened in 1890 as the Maison Lyonnaise, and throughout its life it has kept its customers happy with Lyonnaise regional cuisine. In 2002 it was taken over by Thierry de la Brosse and the famous chef, Alain Ducasse. They have maintained its character brilliantly, offering robust portions of hearty food at prices which bring joy to one’s wallet. 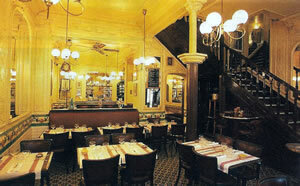 The three course Menu du Jour is 28 euros, and it is this that I am happy to declare the gastronomic bargain of Paris. If such good food, served with such friendliness in such convivial surroundings, can be had in the French capital for less, I will be astonished. The Menu du Jour includes dishes from the carte, but it was the latter to which I went for my own four courses. This pushed the price up to 66 euros, which I still considered very good value. Chef Sébastien Guénard sends many of his dishes to the table in copper frying pans or cast-iron pots, from which one serves oneself at the table. In this context, this seemed absolutely right. I enjoyed the business of filling my plates. And I enjoyed it particularly because what I was spooning out was of such high quality. From my first red iron pot I tucked into a casserole of vegetables, pear and fried potatoes. Here were wonderful tastes and textures, with the pear adding enormously to the pleasure of the whole. Then came scallops, fried with precision, their sweetness well balanced by the slight bitterness of shredded celeriac and braised celery. My main course was braised shoulder of wild boar with winter vegetables, a gamey confection again brought to the table in an iron pot. This meat was gloriously tender. I thought it right to end with a decent pear soufflé. Now I want to salute the chef sommelier Matthieu Buffet. His list is about 100 strong, all French and strongest in red and white burgundy and red rhone. Prices range from 25 euros for a white Côtes-du-Rhône (Samorëns, Ferraton Père & Fils, 2005) to 900 euros for a 1998 Chevalier-Montrachet (Dom. d’Auvenay), with many bottles in the 30 to 60 euros price range. The reason I wish to pay particular tribute to Monsieur Buffet is because he brought me exactly what I wanted. For my white, I asked him for a full-bodied wine with discreet fruit, vanilla, toast and some nuttiness. His selection was a white burgundy with precisely those qualities – Saint-Romain, Dom. Champy, 2003 (55 euros). And he was equally spot-on with my red. I thought the boar should have a rhone in the modern style, with firm tannins, ripe fruit and some residual sweetness. And there it all was – in the 2003 Côtes-du-Rhône Villages Rasteau, Gourt de Mautens, J. Bressy (80 euros). Both these bottles were delicious. I left Aux Lyonnais in a happy frame of mind. After all, I thought, the French capital was not about unreliable taxis and congested roads. It was about the joys of the table – good food, excellent wine and friendly company. I had found all three at Aux Lyonnais. And I had discovered the gastronomic bargain of Paris. 32 rue St-Marc, Paris 75002, France.